Had an interesting day working on book 7 of my Farrell Family Saga. Today’s writing included lots of nostalgia through discussion between the characters. When I review my work tomorrow, I’ll be looking for redundancy and hopefully there won’t be too much. I seldom review my writing on the same day I wrote it. I always give it a day to settle. Then, when I sit down to write the next day, I start by editing what I wrote the day before and make any adds/deletes/changes before I move the story forward. Also, today I worked on some critiques I received from my fellow writers in the LHCWG, Lake Havasu City Writer’s Group,. Lots of valuable feedback. I will miss the group. I resigned last month after being with the group for over ten years. In fact, I was one of the founders of the group. The group has grown from around 10 writers to over 30, which means a lot of reading to be able to give my fellow writers good critiques. Also, they are becoming a community involvement group and will be offering scholarships. For the most part, they are talented, fun-loving and motivated writers and I will still enjoy socializing with many of them. But, they have outgrown my needs which is to just read my fellow writers work and give them constructive feedback, then receive the same in return for my writing submissions. Fortunately, I have several readers who like editing my work. Getting feedback from readers who enjoy my genre is very valuable and I am blessed to have them, especially now. Spent a fun day in Kingman, AZ at their annual KABAM (Kingman Area Books Are Magic) festival. Lots of authors attended, at least 5 from Lake Havasu City. The three sitting near me in the author’s tent were from the Phoenix area. The variety of genres was quite varied, but there did seem to be a lot of fantasy and children’s books. To supplement the author sales, there were booths containing food, arts, crafts and clothing. The planners worked hard and were so very accommodating to us authors. They had entertainment on a small stage from 10 am to 4 pm consisting of musicians, poets and story tellers. The only drawback was lack of customers/readers. Most of the folks who stopped at my table to talk to me were authors who had tables themselves. I didn’t make many sales, but met some interesting folks. My favorite was a nine year old boy who kept coming back to my table to talk. He said he loved to read and intended to write his own book someday. I made him promise that he would write a ‘book’ and bring it to my table next year so I could read it. He said he loved fantasy and had many ideas of his own, especially regarding a character called ‘Flash’. I enjoyed his positive outlook on life and his promise to write his book. I’ll look for him at next year’s KABAM. Mike, one of the moderators on the small stage, came around and interviewed the authors. He would take that info to the microphone and do a nice ad/promo for that author’s selection of books. When he did mine, he talked about my Farrell Family Saga series of books. He said the name, then spelled it out. Because, he joked, folks might think it was the ‘Feral’ Family. He laughed and said maybe they were feral which could make them a different kind of exciting reads. I do have to admit that, at times, some of the Farrell brothers have acted quite feral. Anyway, it was a cute promo and I thank Mike for it. 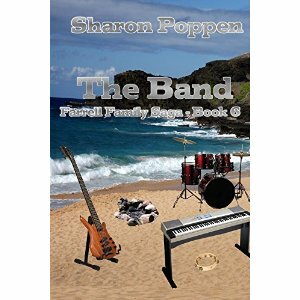 Sharon Poppen’s latest novel, The Band – Farrell Family Saga Book 6, is now available in both print and ebook at Amazon.com. Below is the blurb on the back cover of the book. The world has tended to the wounds suffered across the lands. Human nature has picked up the pieces and prosperity looms for those willing to accept the past, but look to the future and all the possibilities it offers. The latest generation of the Farrell Family has joined in looking toward the future. They continue to love ranching and daily intermingling with the land and the livestock, but another love has taken the attention of the sons of Josh and Lani Farrell. Their Hawaiian ancestors have instilled a love of music in all four sons. In this novel, the Farrell brothers are ranchers by day and musicians by night after forming a quartet to entertain tourists in the nightspots of Maui. Growing up as son of a father who gave so much during the Second World War, oldest son J.J. took on responsibilities as devoted son and reliable brother. He accepted those responsibilities readily. In addition to his brothers, a child of druggie parents comes under his protective wing. This child, Annie, becomes the love of his life. A talent agent discovers the brothers and lures them into the wild world of rock and roll music. They take the name The Islanders and the four young Farrell men are introduced to the exciting, yet dangerous, world of music. A world filled with fan admiration, exhausting touring, alcohol, drugs and women wanting their night with a music idol. A world not appreciated by their wives. As usual with the Farrell family, what happens to one Farrell affects every Farrell from grandparent to grandchild. I hope this family continues to touch your heart and that you’ll want to read on to discover how this next Farrell generation copes with the changing times as they search for their generation of love, happiness and peace in their lives. I will be signing my latest book ‘Stephen’s Boys – Farrell Family Saga, Book 5’ at Hastings Books Music & Video on Sunday, January 31st between 11 a.m. and 2 p.m. Hastings is located at 321 N. Lake Havasu Blvd. here in Lake Havasu City. Hope you get a chance to stop by to say hi. 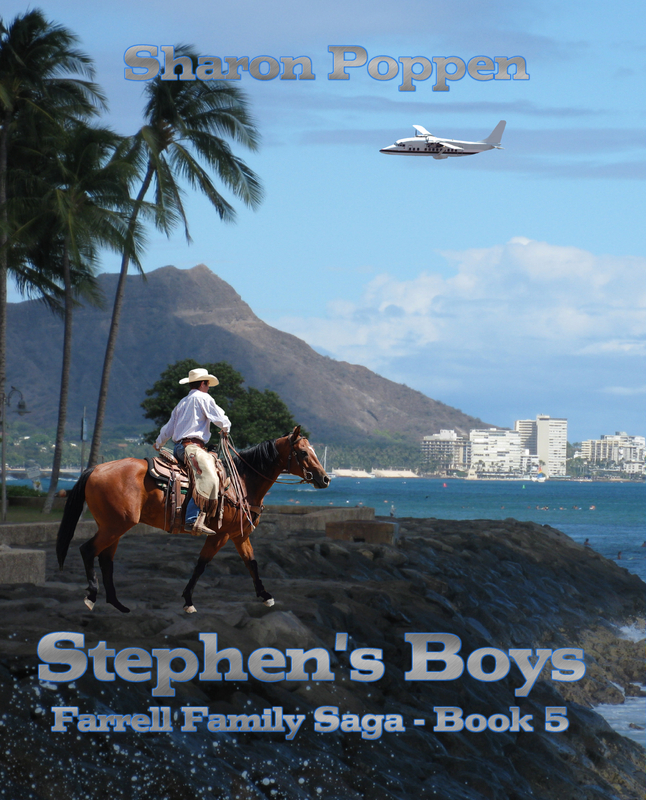 Stephen’s Boys – Now Available! Pick up your copy of the 5th book in the Farrell Family Saga. Click Here! Just posted a new short story. With high school graduations happening all over the country, I thought my readers might enjoy the tale of a nerd’s attempt to change his image as he exits his high school years. You can find it on the menu along the right side of my website under the category ‘Story of the Week’. Just a fun piece I hope you enjoy. Congrats to all the graduates who will be moving on to high school, college or careers. Work hard, make plans for the future, but most of all remember to have fun. Join Sharon Poppen Saturday, May 9th, 2015 from 11 a.m. to 2 p.m. at Hastings Entertainment, 321 Lake Havasu Avenue North, Lake Havasu City, Arizona. 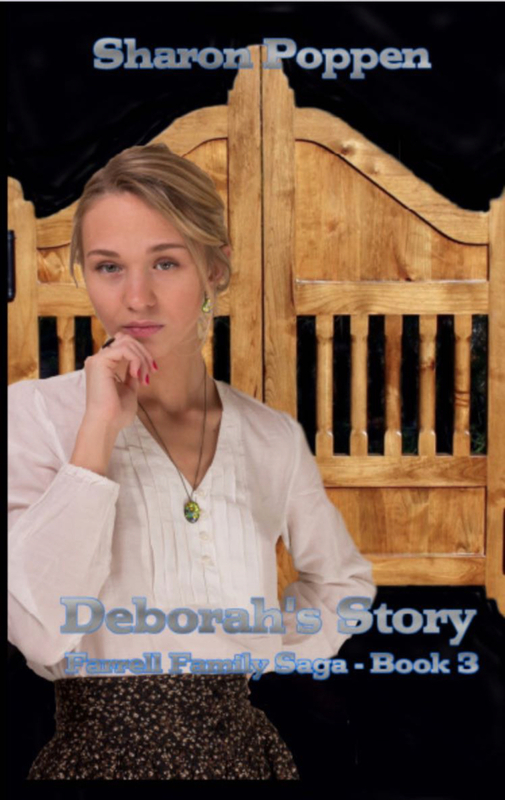 She will be signing her newest novel, “Deborah’s Story” which is the third book in the Farrell Family Saga. Join Sharon at KABAM! — Kingman Area Books Are Magic. Sharon Poppen will be at KABAM — the Kingman Area Books Are Magic event on May 2, 2015. Located at 315 W Beale at Grandview, in Kingman, Arizona, the 4 acre Metcalfe Park will be home to the Eleventh Annual book festival. Come join in the fun! Authors…Books…Live Entertainment…FREE Family Fun…and a chance to meet and greet Sharon Poppen and many other local authors.